Between the 1950′s and the 1960′s, a political movement known as Neo-conservatism was born under the liberal hawks of the Democratic Party in the United States. The liberal hawks or the neoconservatives (also known as the neocons) essentially disagreed with the Democratic Party’s stance against the Vietnam War and their domestic policies such as U.S. President Lyndon B. Johnson’s Great Society by eliminating poverty and racial injustice (An important note: LBJ was a racist and was forced to adopt his Great Society programs due to Martin Luther King Jr. and public pressures from the Civil Rights movement). During the same time period between the 1950s and the early 1960s, the neoconservatives supported Martin Luther King Jr. and the civil rights movement. Then came the Vietnam war where the liberal hawks called for military action to prevent the Communists from taking power in Vietnam. The neocons were also proponents of the Cold War and supporters of Israel’s illegal occupation of Palestine. The American New Left (many endorsed Marxist-Leninist policies) including the civil rights movement, feminists and the Black Power movement were opposed to any war and Israel’s policies towards the Palestinians and of course they were labeled as anti-Semites by the neocons (many were and still are Jewish-Americans). The neocons made their way to the Reagan administration with Eliot Abrams and company with wars in Central America including Nicaragua and El Salvador. The Kagan family, America’s neoconservative aristocracy, has reemerged having recovered from the letdown over not gaining its expected influence from the election of Hillary Clinton and from its loss of official power at the start of the Trump presidency. Back pontificating on prominent op-ed pages, the Family Kagan now is pushing for an expanded U.S. military invasion of Syria and baiting Republicans for not joining more enthusiastically in the anti-Russian witch hunt over Moscow’s alleged help in electing Donald Trump. In a Washington Post op-ed on March 7, Robert Kagan, a co-founder of the Project for the New American Century and a key architect of the Iraq War, jabbed at Republicans for serving as “Russia’s accomplices after the fact” by not investigating more aggressively. 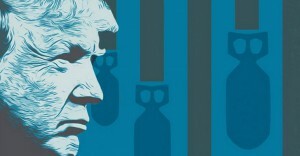 Then, Frederick Kagan, director of the Critical Threats Project at the neocon American Enterprise Institute, and his wife, Kimberly Kagan, president of her own think tank, Institute for the Study of War, touted the idea of a bigger U.S. invasion of Syria in a Wall Street Journal op-ed on March 15. Yet, as much standing as the Kagans retain in Official Washington’s world of think tanks and op-ed placements, they remain mostly outside the new Trump-era power centers looking in, although they seem to have detected a door being forced open. Still, a year ago, their prospects looked much brighter. They could pick from a large field of neocon-oriented Republican presidential contenders or – like Robert Kagan – they could support the establishment Democratic candidate, Hillary Clinton, whose “liberal interventionism” matched closely with neoconservatism, differing only slightly in the rationalizations used for justifying wars and more wars. So let’s take a look at what Baker described as neo-conservatism in regards to President Trump’s ideology when it comes to the U.S. war machine, torture and the defense of Israel. Trump is replacing members of his administration with war hawks and neoconservatives with the new Secretary of State Mike Pompeo, the former CIA Director who once said that “Prime Minister Netanyahu is a true partner of the American people.” Pompeo gave a speech at the Center for Strategic and International Studies (CSIS) in 2017 and said that “It is time to call out WikiLeaks for what it really is – a non-state hostile intelligence service often abetted by state actors like Russia.” You can guess where all this is leading to. Pompeo will be replaced with Gina Haspel, A CIA operative who oversaw torture and got rid of the evidence of any wrong doing. If approved by congress, both Pompeo and Haspel will be placed in positions of power and practically rubbing elbows with John Bolton was also just appointed to be Trump’s National Security Advisor. Bolton is another neoconservative psychopath who advocates for war on every nation on earth. Bolton is a pro-Israel supporter and a former U.S. ambassador to the U.N. under the war criminal and former U.S. president, George W. Bush Jr. So what is the endgame? A long war in the Middle East and beyond is on the agenda. It is the biggest budget the Pentagon has ever seen: $700bn. That’s far more in military spending than the US’ two nearest competitors, China and Russia, and will mean US army can foot the bill for thousands more troops, more training, more ships and a lot else. And next year it would rise to $716bn. Together, the two-year deal provides what US Defense Secretary James Mattis says is needed to pull the military out of a slump in combat readiness at a time of renewed focus on the stalemated conflict in Afghanistan and the threat of war on the Korean Peninsula. More U.S. taxpayer money will be going to the Military-Industrial Complex to prepare for more unending and may I add, unwinnable future wars. In a speech yesterday at the conservative Heritage Foundation in Washington, John R. Bolton, the under secretary of state for arms control, publicly alluded to conclusions that American intelligence agencies have reached in recent months after protracted internal debate. What is the most disturbing aspect to John Bolton’s ideology is when it comes to Israel’s defense concerning Iran. 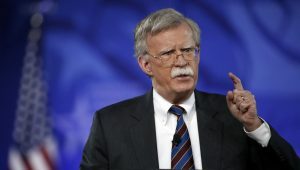 In 2009 Bolton gave a speech at the University of Chicago and said that “Unless Israel is prepared to use nuclear weapons against Iran’s program, Iran will have nuclear weapons in the very near future.” One thing Bolton’s statement confirmed in regards to Israel’s use of nuclear weapons against Iran’s nuclear program is that a public figure who has been around Washington for some time, admitted that Israel has nuclear weapons. The danger Bolton poses to America’s adversaries throughout the world is astounding. Bolton as Trump’s National Security advisor clearly paints a path to numerous wars, perhaps even a nuclear war with Iran, Russia and China. So will other Neocon lunatics be considered for positions within the Trump White House including Paul Wolfowitz, Eliot Abrams, David Frum or even Democrats who are neoconservatives who were Hillary Clinton supporters such as R. James Woolsey, a former Director of the CIA from 1993 to 1995 under the Clinton administration and Chair of the Board at Foundation for the Defense of Democracies (FDD) who basically told The Jerusalem Post in November 2017 that the U.S. should destroy the Islamic Revolutionary Guard Corps infrastructure and Iran’s nuclear facilities. Woolsey said that “the next time the IRGC looks cross-eyed at us… we should turn loose six to 12 MOAB [GBU-43/B Massive Ordnance Air Blast] bombs on their facilities” and “given what a source of terrorism the IRGC is… instead of talking and proportionality – the hell with proportionality. We should destroy virtually everything we can that has to do with the IRGC.” Sounds like Trump’s kind of guy. The “neocons” believe American greatness is measured by our willingness to be a great power—through vast and virtually unlimited global military involvement. Other nations’ problems invariably become our own because history and fate have designated America the world’s top authority. Critics say the US cannot afford to be the world’s policeman. Neoconservatives not only say that we can but we must—and that we will cease to be America if we don’t. Writes Boston Globe neoconservative columnist Jeff Jacoby: “Our world needs a policeman. And whether most Americans like it or not, only their indispensable nation is fit for the job.” Neocon intellectual Max Boot says explicitly that the US should be the world’s policeman because we are the best policeman. As we rebuild America’s strength and confidence at home, we are also restoring our strength and standing abroad. Around the world, we face rogue regimes, terrorist groups, and rivals like China and Russia that challenge our interests, our economy, and our values. In confronting these dangers, we know that weakness is the surest path to conflict, and unmatched power is the surest means of our defense. For this reason, I am asking the Congress to end the dangerous defense sequester and fully fund our great military. I agree with Trump that the world is not ready to relinquish its nuclear weapons, especially when his administration is calling for the modernization and the rebuilding of the U.S. nuclear weapons arsenal. Gina Haspel was a former intelligence officer and a Deputy Director of the CIA is now a nominee to head the controversial agency under Trump. Trump will also reinstate torture which he made clear with his nomination of Gina Haspel. Haspel oversaw the use of torture (or Enhanced Interrogation Techniques’ which is an Orwellian term for torture) and then buried the evidence. Torture is illegal under international law. During the Bush administration, Haspel was chief of a black site or a CIA torture chamber which was located in Thailand. Alleged members of Al Qaeda who were detained in the black site including Abd al-Rahim al-Nashiri and Abu Zubaydah where tortured by waterboarding. Fast forward to June 7, 2017, the European Center for Constitutional and Human Rights (ECCHR) called on the Public Prosecutor General of Germany to issue an arrest warrant against Gina Haspel who should be considered a war criminal. Trump’s choice for the directorship of the CIA only means that torture will be secretly reinstated. Under Haspel’s watch, it would be difficult to obtain any sort of evidence of torture. What is also possible is the return of Forced Renditions or what is called “U.S. government-sponsored abduction” which basically means kidnapping someone who is suspected of being a terrorist whether they are in the street or in their home by a group of masked men and then thrown into a van and then is transferred from one country to another to be tortured under U.S. supervision. With the nomination of Gina Haspel, there seems to be a renewed interest in torture, which is another element of neoconservative ideology. The highly controversial decision that Trump has promised to Israel is to move the U.S. embassy to Jerusalem from Tel-Aviv and the same time, cutting aid to the Palestinian Authority shows how far Trump is willing to go to appease Israel. Trump recognized Jerusalem as Israel’s capital early in his administration with his announcement that the U.S. embassy was going to move to Jerusalem is a clean break from U.S. policy. Jerusalem has been the main subject of any final-status negotiation that took place between the Israelis and Palestinians who both claim that Jerusalem is their capital. Trump (who is clearly ignorant about the Middle East in general) had mentioned that he believed that moving the U.S. embassy to Jerusalem would allow the peace process to move forward, since the Jerusalem issue would be taken off the table since it was always a subject of disagreement between the Israelis and Palestinians. Trump’s announcement about the U.S. embassy move going forward was condemned by the international community, especially in the Middle East. In a U.N. General Assembly vote, 128 countries voted against the recognition of Jerusalem as Israel’s capital for the Jews. Trump has been a staunch supporter of Israel (just like most of his predecessors) the second he hit the campaign trail. When he was elected, he appointed Nikki Haley who attended the last American Israel Public Affairs Committee (AIPAC) event earlier this month and said “When I come to AIPAC, I am with friends. And at the UN, we don’t usually have very many friends.” Well, she was right about that, especially when Israel and the U.S. has traditional ignored numerous U.N. resolutions that recognize the right of Palestinian self-determination or for Israel to cease its repressive measures. Several resolutions also called for U.N. observers to investigate Israel’s actions in the occupied Palestinian territories or to impose sanctions against Israel if it did not follow the U.N. councils resolutions. The U.S. has vetoed numerous resolutions put forth by the U.N. Security Council that have been critical of Israel for decades. Trump has surrounded himself with people who are extremely pro-Israel including his ambassador to Israel, David M. Friedman who told the Israeli newspaper, Haaretz in 2016 that Trump would support Israel annexing parts of the West Bank and that “Israel has to continue to build in the settlements because there is no reason not to do so.” What makes matters worse is that Trump’s son-in-law, Jared Kushner was a co-director of the Charles and Seryl Kushner Foundation from 2006 to 2015 that funded an Israeli settlement that was considered to be illegal under international law. If that is not what Gerard Baker described as one of the characteristics of neoconservative ideology in regards to “aggressive Zionism”, then I don’t know what is. Trump is clearly a pro-Israel Zionist like many in Washington whether they are Democrats or Republicans (close to forty people in U.S. congress has dual US-Israeli citizenships). Former U.S. Vice-President to Barack Obama, Joseph Biden once said “I am a Zionist. You don’t have to a Jew to be a Zionist”and he is absolutely correct. Trump is preparing a war cabinet for a major Middle East conflict that can spiral out of control. Trump and Israel’s Prime Minister, Benjamin Netanyahu are on the same page when it comes to Israel’s neighbors in the Middle East and with his appointment of John Bolton, a war against Syria, Hezbollah, Lebanon and Iran is on the table. So the Question Remains, Is Trump a Neoconservative? Trump’s words, actions and his recent appointments of John Bolton, Mike Pompeo and Gina Haspel points towards a cycle of endless wars especially in the Middle East. With Iran in the cross-hairs, World War III will be in the foreseeable future but not before the U.S. Presidential elections in 2020. It will most likely start in Trump’s second term if he is re-elected or even if a Democrat who will most likely be in the pockets of the Israeli lobby becomes the next U.S. President. However, from now until 2020, anything can happen under Trump concerning the wild card, Israel. Trump and Israeli Prime Minister Benjamin Netanyahu want to cancel Iran’s nuclear deal. With Israel itching to attack Iran with its nuclear weapons arsenal and now with John Bolton as Trump’s National Security advisor who advocates for the bombing of Iran and North Korea, it can be possibility. But it is up to Iran, Russia and China to counter any U.S., Israeli and Saudi led aggression by showing their unity and their military strength which can deter a major war. Peace seems impossible with the Trump first giving the military full authority to conduct war and covert operations around the world then filling the Whitehouse with extreme war hawks, torturers and neocon psychos. Trump acts and talks like a neocon, perhaps he is a neocon, but then again, maybe it’s just plain old politics in Washington.